Amid the bustle of Waterdeep, within the Castle Ward where barristers, nobles, and emissaries battle with word and contract, stands an inn not quite like any other. Before there was a Castle Ward or even what could be recognized as an ancestor of the City of Splendors, there was a dungeon, and in that dungeon begins the tale of the Yawning Portal. In ages past, the mighty wizard Halaster built his tower at the foot of Mount Waterdeep and delved deep into tunnels first built by dwarves and drow in search of ever greater magical power. Halaster and his apprentices expanded the tunnels they found, worming out new lairs under the surface for reasons of their own. In time, their excavations grew into the vast labyrinth known today as Undermountain, the largest dungeon in all of the Forgotten Realms. Halaster eventually disappeared, as have all his apprentices, but the massive complex he built remains to this day. For untold years, the secrets of Undermountain remained hidden from the surface world. Everyone who entered its halls failed to return. Its reputation as a death trap grew to the point that criminals in Waterdeep who were sentenced to die were forcibly escorted into the dungeon and left to fend for themselves. All of that changed with the arrival of two men, a warrior named Durnan and a ne'er-do-well named Mirt. The duo were the first adventurers to return from Undermountain, laden with riches and magic treasures. While Mirt used his wealth to buy a mansion, Durnan had different plans. Durnan retired from adventuring and purchased the land on which sat the deep, broad well that was the only known entrance to the dungeon. Around this well he built a tavern and inn that caters to adventurers and those who seek their services, and he called it the Yawning Portal. Some of the magic Durnan looted on his successful foray into Undermountain granted him a life span that exceeds even that of an elf. And for decades Durnan left delving into Undermountain to younger folk. Yet one day, something drew him back. Days of waiting for his triumphant return from the dungeon turned to months and then years. For nearly a century, citizens of Waterdeep thought him dead. But one night, a voice called up from the well. Few at first believed it could be Durnan, but folk as long-lived as he vouched it so. The Yawning Portal had passed into the hands of his ancestors, but Durnan returned with enough riches for them to quietly retire. Durnan took his customary place behind the bar, raised a toast to his own safe return, and then began serving customers as if he'd never left. 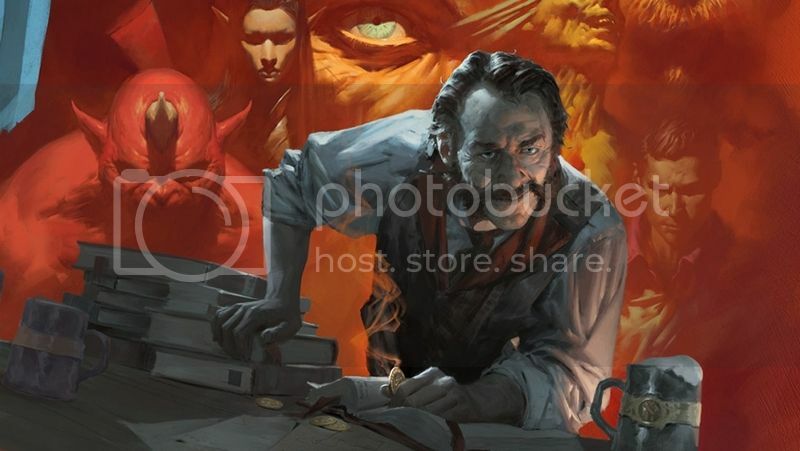 Adventurers from across Faerun, and even from elsewhere in the great span of the multiverse visit the Yawning Portal to exchange knowledge about Undermountain and other dungeons. Most visitors are content to exchange stories by the hearth, but sometimes a group driven by greed, ambition, or desperation pays the toll for entry and descends the well. Most don't survive to make the return trip, but enough come back with riches and tales of adventure to tempt other groups into trying their luck. This is a Dungeons and Dragons 5th Edition game, set in the world of Forgotten Realms. Players will be required to have access to the 5th Edition Players Handbook, at least. Races and classes for this game are limited to those found within the 5E PHB. Starting Level is 1st, with no evil alignments permitted. Stats may be obtained by rolling 4d6 six times, dropping the lowest and rerolling 1's. You may do this twice and take the best set. Due to lack of players, this game will be gestalt, with a few modifications to the gestalt rules for 5e. Starting level is still 1st, but you will choose two classes, instead of one.